Backslash -- an "art/design" project from NYU Interactive Technology Program researchers Xuedi Chen and Pedro G. C. Oliveira -- is a set of high-tech tools for protesters facing down a "hyper-militarized," surviellance-heavy state adversary, including a device to help protesters keep clear of police kettles; a jammer to foil Stingray mobile-phone surveillance; a mesh-networking router; a "personal cloud" that tries to mirror photos and videos from a protest to an offsite location; and tools for covertly signalling situational reports to other protesters. The kit was inspired by the experiences of protesters at the Gezi Park demonstrations in Turkey; the Hong Kong Umbrella Revolution; and Brazil's Vinegar Revolt. The designers don't plan on making the kit available; instead, it's designed as a "provocation" to stimulate discussion about the nature of protest in the 21st century. One activist told Ars Technica's Joshua Kopstein that he advised against carrying high-tech gear (or even running shoes or a camera) to a protest, to prevent the police from targeting you. Backslash's designers acknowledge that if their tools were deployed in the field, they'd have to be disguised to prevent such a crackdown -- the demo/prototypes are designed with a kind of cinematic chicness that conveys protest-cool in a very eye-catching way. Beyond aesthetics, the kit makes a bunch of smart technological choices. It incorporates something like Sukey, the British app to help protesters avoid "kettling," the police tactic of confining protesters to a small space, often followed by beatings and other human rights abuses. It improves on Sukey by incorporating a signalling tool (a "panic button") reminiscent of the anti-kettling wearable I described in my novella Lawful Interception. Meshing wireless communications is a holy grail of protest movements, a response to the police tactic of shutting down or jamming mobile data services around a protest (see, for example, BART's wireless shutdown during the 2011 protests) -- this can be a prelude to seizing and/or wiping cameras and other devices to erase evidence of human rights abuses. So the Backslash kit includes an easy-to-operate meshing wireless system. The secretive use of Stingray surveillance devices is a worry for protesters, because it can be used to gather the identities of all participants at a demonstration, targeting them for reprisals -- as occurred in during Kiev's Euromaidan uprising, when police captured the mobile phone identifiers of protesters and later texted threatening messages to them. You can avoid Stingrays by turning off your phone or putting it in a Faraday pouch, or by putting it in airplane mode (assuming your phone hasn't been infected with malware that covertly disables airplane mode) -- but Backslash offers you a low-powered cellphone jammer that makes it theoretically impossible for a Stingray to read it, while still leaving it free and uncovered for use as a video/still camera. The Backslash personal cloud drive tries to exfiltrate your images to an offsite storage, while taking care of operational security by wiping out identifying metadata that your mobile device will usually default to adding. The researchers claim that all the technology in their project actually works and they describe it as "open source", but have not made their schematics, source code, etc available as far as I can tell, so it's hard to say whether it would withstand adversarial scrutiny and countermeasures, but it's a smart, handsome and provocative piece even without that (especially given that they're not proposing to equip protesters with any of this gear). Technology has been playing an important role in new wave of protest, from Arab Spring to Occupy Central. 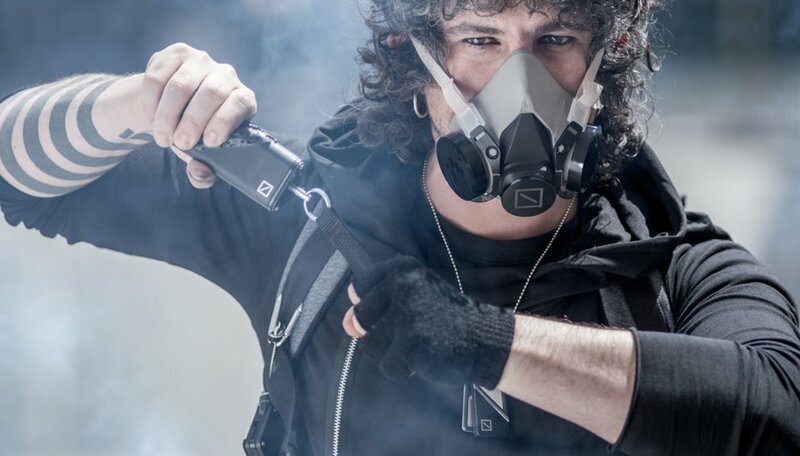 These technologies can be divided up into two categories: Those used by the authorities (long range acoustic devices, water cannons, active denial systems, stingrays, etc) and those used by protestors (social networks and DIY protection gear). There is a huge disparity between the amount of technologies used by the authorities and the technologies available to protesters and activists during protests and riots. That gap is only getting wider. While social networks like Facebook, Twitter and Firechat have played important roles in allowing activists to organize and spread messages, we found one fact to be extremely interesting. During the Arab Spring movement, the highest levels of participation were seen during periods of internet blackouts. This happened because, besides being an early adopter, young, and a digital native... the modern protester believes that connectivity is a basic human right. The future of technology in protests looks dark. India has been testing drones mounted with pepper spray and North Dakota is recently the first state in the U.S. that legalized police use of drones fitted with tasers. How can the global community retain the right to free speech and public assembly in a safe and effective manner? How can we level the technological playing field for activists and the general population? Could we develop open source devices to help activists communicate during a network blackout or to aid protesters to avoid conflict with the authorities? As designers, we find this to be a very compelling challenge. We are interested in the technologies that could help to start this conversation.